It is not known for certain when Brother Branham first journeyed to sunset, perhaps as early as 1948. His guide on that introductory trip, a prospector from Phoenix, named Wallace Macanally, can recall only that they drove there in his 1947 Ford and experienced a flat tire along the way. Their quarry was the elusive Javelina, but the true success of the hunt can better be measured by the fact that Brother Branham continued to make his way to Sunset in the spring of the year, just as often as his schedule would allow. In 1963, the attraction at Sunset Mountain begin to shift from the 'natural' to the 'supernatural'. That year the road to Sunset actually began in Jeffersonville, Indiana, on the morning of December 22, 1962. That morning Brother Branham was due to carry his daughter to the hospital where she was doing volunteer work. Both mother and daughter were now anxious because Brother Branham was still secluded in the bedroom. Approaching the bedroom door, Sister Branham gently knocked several times. Receiving no response she quietly called, "Bill, are you alright?" She was concerned because he had now been in the room for nearly two hours. She called his name again - still there was no reply. Of course, in this household where supernatural happenings were commonplace, Sister Branham realized that perhaps something supernatural was happening in the room. On the other side of the door, God's servant and prophet sat with his eyes transfixed to the verse of Scripture on the page in front of him: "Behold, I lay in Zion a stumbling stone and rock of offense: and whosoever believeth on him shall not be ashamed." He closed the Bible and walked to the window. Raising his hands, Brother Branham prayed for understanding. It had been a strange morning for him. But as he slipped into the vision, the knocking on the door and the sound of his wife's voice sounded way of in the distance; till finally he was oblivious to all around him - he now saw only the vision. It was about nine o'clock, and in the vision, he found himself standing in the West, seemingly around Tucson, Arizona, and he was picking a cocklebur off his jeans. With him in the vision was his young son, Joseph, and they were talking when he saw before him a big bush. In the bush was a cluster of tiny birds. There were two or three birds on the top limb, six or eight on the next limb, and fifteen to twenty on the bottom limb, forming the shape of a pyramid. It seemed that the birds. looking tired and battle-scarred, were trying to say something, but suddenly, they few off towards the East. Immediately a flock of slightly larger birds, resembling doves, flew past him, going from the West to the East. They were travelling much swifter than the smaller birds, and when they had passed, he turned and looked again to the West. At once, he heard a loud blast that sounded like a plane breaking the sound barrier, or even a great clap of thunder. It shook the earth, and coming from afar off, out of eternity, he saw a constellation of Angels. They travelled faster than sound, their wings arched and their faces in profile. He didn't have time to count, but there appeared to be no less than five, and no more than seven. They too were in the form of a pyramid. In the twinkling of an eye they were with him., and (in the vision) he felt the power of God lift him up to meet them. Still in the realm of the vision, he reasoned that this must mean his death was imminent, perhaps in an explosion. But he could still hear the voice of his son, and he realized that if, indeed, it had been an explosion, it would have killed the boy also. Then he knew it was the Angels of the Lord coming to give him his New Commission. He raised his hands and cried out, "Lord Jesus, what will you have me to do?" And the Vision left. Coming out of the Vision, Brother Branham was left feeling numb and breathless. More than an hour later, he still felt as though he were detached from his body. Still troubled as to the exact meaning of the vision he said, "Lord Jesus, if this means that I'm going to be killed, and you are finished with me on earth, let me know and send your power back on me again." He waited but nothing happened. Then he said, "Lord Jesus, if it means that you have something for me to do and it is to be revealed to me later, then send your Power Again." The Anointing and Power of God came down and almost took him from the room. When he finally emerged from the bedroom it was nearly noon. He told his family only that he needed to spend the remainder of the day in study, since he was scheduled to preach at the Tabernacle the following day. In the above vision Brother Branham was standing somewhere in the West. To coordinate the fulfillment of the vision, the Lord had already, in 1958, given His Prophet another vision, showing that when a certain thing happened concerning his property in Jeffersonville, it would be a 'sign' for him to move Westward. This vision of 1958 was followed by 'six dreams' given to other Believers - ALL dreams spoke of the prophet going West. In December 1962 Brother Branham's 1958 vision concerning his property was fulfilled. It was his 'sign' to turn westward. On December 30, one week after receiving the Vision of the Seven Angels, he informed his congregation of his decision to move to Tucson. He told them of the Dreams and the Visions and said, "And I am going, I don't know where, I don't know why. I can't tell you why. But there is only one thing I know: just follow what he says do. I don't know which way to turn." On this particular day Brother Branham, Brother Fred Sothmann and Brother Gene Norman were preparing for to leave on a hunting trip. It was already mid-day when they left for Sunset Mountain in Brother Sothmann's white pick-up truck. They had only three days left in the Javelina hunting season. Less than two hours after leaving Tucson, they turned off the paved road at Wilcox and unto the dirt road that led to Bonita and into the canyons scattered along the rimrock of Rattlesnake Mesa. One hour later, each of the brothers had shouldered their rifles and gone their separate ways. The first day of the hunt didn't prove very successful - neither of the brothers had bagged any game. But the next day Brother Branham was successful in finding a good sized Javelina. The other two hunters were not so fortunate, but since he now knew the general vicinity of where the herd was located, Brother Branham promised to point them in the right direction the next morning. The three brothers headed back to their campsite for the evening. Camp was a simple affair - a fire, three folding chairs, and a small table - where they could sit, eat and talk - or listen, which was the case on their second night in camp. As Brother Branham was to relate later, the Presence of the Holy Spirit was tremendous in the camp that night, and HE began to reveal (by visions) things that were taking place in the lives of the brothers and their family members. To break-away from the Visions which could easily exhaust him, Brother Branham finally got up and walked a distance away from the camp. By mid-morning of the third day, the brothers were once again hunting the elusive Javelina. The sun filtering through the scantily clad branches of mesquite brush provided a perfect shade camouflage for the stiff grey and brown bristles of the small herd of Javelina. A gust of wind danced its way through the prickly pear and barrel cactus, picking up desert dross and leaving a smudge of dust in its wake. The largest of the feeding Javelina cautiously stepped out of the shade and moved towards a tempting patch of tender, green, ground-cover nearby. He sensed nothing amiss, and, responding to his leadership, the remainder of the her soon followed him into the bright sunlight. Across the gully, the hunter wearing the black hat, was nearing the top of the ridge and he paused in his climb to look around. Jagged rocks littered the vicinity. Just ahead he could see a faint deer trail winding down from the high mesa that swept Eastward. The sky was clear and the morning was cool, but an aggressive sun would soon press the temperature into the high seventies. Finding a clear spot, the man sat down and began to remove the cockleburs that had fastened themselves to the legs of his denim jeans. Gingerly, he tugged one of the spiny seeds loose, but then hesitated before tossing it aside. A feeling of familiarity swept over him. "That's strange," he mused, looking at the bean-size pod he held between his fingers. "I recall something about picking a cocklebur off my trouser leg." Most likely, it was hunter's instinct that caused him to look up at that moment, and what he saw triggered an immediate response. The herd of twenty or so Javelinas that he had been looking for since dawn had just wandered into view and were feeding a little more than 500 yards away. Focused on his immediate objective, which was to alert his two fellow-hunter to the location of the game, he threw the now forgotten bur to the ground. Quickly and quietly he rose to his feet, and started up across the ridge. The sound was like nothing he'd ever heard. As the roar of the blast reverberated around him, for one frightening moment he felt as though his body had been catapulted into the air. "I've been shot," he thought, assuming that another hunter had seen his black hat as he was running and had mistaken him for one of the dark-colored Javelina. All around him, gravel and fair-sized rocks that had been dislodged by the blast, bounced noisily down the slope. He than realized that his feet were still firmly on the ground, but he knew that the dimension surrounding him had changed, for standing before him was a pyramid of Seven Mighty Angels. It was the predominant Angel that stood facing him on the left that Gave The Commission: "Return back to Jeffersonville. The Seven Seals Of The Seven Mysteries Will Be Opened. One by One WE Will Bring The Message." An hour later, Brother Norman and Brother Sothmann could not help but notice a difference in Brother Branham's countenance when he joined them; but, as was their custom, they never questioned him. He asked each of them if they had heard the blast, and they assured him that they felt it as well as heard it; But he never inquired as to whether they had seen anything unusual. Neither did he offer them an explanation. Everything just slipped back into the normal hunting routine. "That's the reason I had to go West to connect with these Angel's message to come back here to reveal it to the church. You remember, I said, "The next things that happen will be here at the church." That's just exactly." "Another thing I want you to notice, what taken place, And if you're listening to the tape of the "What Time is It, Sir?" you will notice that one Angel was very notable to me. The rest of them just seemed ordinarily; but this Angel was a noted Angel. He was to my left in the constellation in a form of a pyramid. And you remember, it was in the pyramid where the mysterious white rock was not written on. And the Angels took me into that pyramid of themselves - the mysteries of God known only to them. And now, they were the messengers that come to interpret that pyramid or that Message of the secret of these Seven Seals which lays with inside the pyramid." "Well, it happens to be that at least one man is present this morning who was standing there when it happened. It actually shook the rocks off of the mountain. We find out that during that time I saw seven Angels in a form of a pyramid that swept down and picked me up. And I was brought east to open the Seven Seals for God." The appearing of these Seven Mighty Angels to Brother Branham certainly didn't go unnoticed by the world. 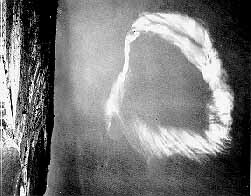 They were certainly aware that a strange "Mysterious Cloud" (pictured below) appeared over Sunset Mountain on Feb. 28, 1963. Today, after over thirty years, "the cloud" remains a mystery in the scientific books. The May 17th, 1963 issue of Life Magazine carried a picture and article on The Cloud. The article was entitled: "A High Cloud Ring Of Mystery." 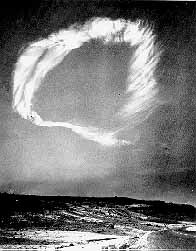 The National Science Magazine also carried the news of the Mysterious Cloud. The cloud was estimated by Science to be 26 miles high and 30 miles across. The height put the cloud far beyond the vapor barrier. No vapor exist at that height. There The Cloud remains a Mystery to all except those who are aware of what God has done in this Age. Seven Mighty Angels broke through the barrier between 'time and Eternity' to Commission a Prophet of God to "finish the Mystery of God" as prophesied in Revelation 10:7. May God make these things a reality in your heart. Follow this link for the explanation of the Supernatural Cloud. We encourage you to search these things out for yourself. Check it with the Word of the Lord. "Heaven and earth will pass away BUT HIS Word will never pass away till all these things be fulfilled."